All of this works as of 27/03/2016. Since Spotify regularly modifies functionality and what can be done through the API this is liable to change at any time. * According to this conversation playlists aren’t permanently deleted, just prevented from displaying. This support article has instructions on how to recover a deleted playlist but I haven’t bothered testing it. The easiest ways to deal with splitting a big list into smaller lists are to either create new playlists and drag and drop or copy and paste the tracks inside the desktop app or to use any text editor that shows line numbers like Notepad++. Select all the tracks in the Spotify desktop app with Ctrl-A, copy with Ctrl-C then paste them into a blank text file. Create a new playlist in Spotify, select the tracks you want to add to it in the text file and copy them, then paste into the empty playlist with Ctrl-V. This converts playlists into a load of different formats, can create new playlists inside Spotify. Lets you build playlists using plain text in the format [Song Title] – [Artist], e.g. This takes playlists from inside Spotify and spits them out as plain text. Plain text lists can then be copied and pasted into Playlist Converter. Also removes duplicates from playlists and generates playlists from plain text input, though this second feature is flaky at best. Rather complicated drag and drop tool that allows multiple sources to be combined and messed with to create new playlists. Went offline with no notice as I was using it. Can generate hugely detailed playlists with very granular control over what goes in and how it’s all mixed together, if that’s your thing. Relative date feature allows a Discover Weekly Archive playlist (or any other large list) to be rather painstakingly split into smaller lists based on when tracks were added to it. Quick howto: Making a playlist only of tracks you’ve saved to your music from the Discover Weekly archive. 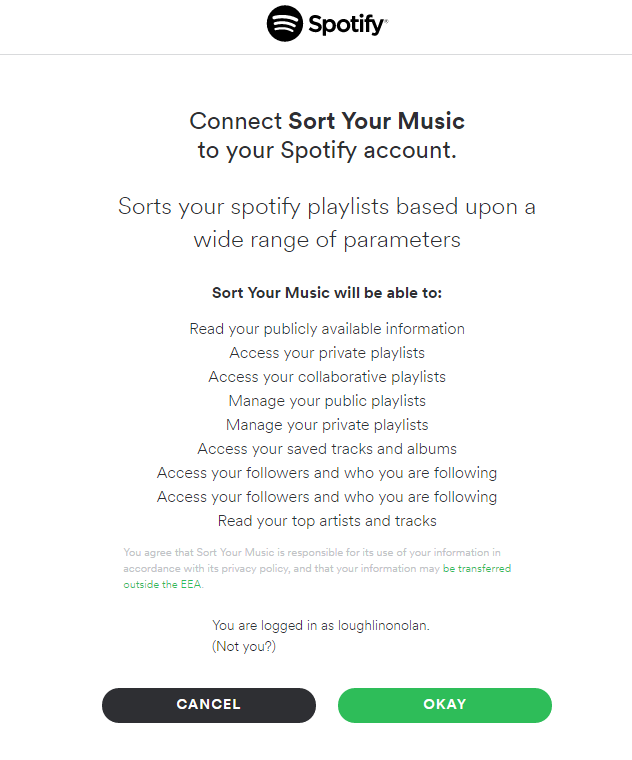 Go to Smarter Playlists and login to Spotify, authorise Sort Your Music. Click the +NEW PROGRAM button. You should see this. Click on the title and description at the top of the screen to modify them. Now add two sources from the list on the left: my saved tracks and playlist. There’s nothing you can change in my saved tracks so leave it alone. Double click the playlist box (which defaults to calling itself ‘Your favourite coffeehouse’) You should get a popup like this. The name can be anything you want but should be something you’ll recognise later so probably best to keep it the same as the playlist’s name in Spotify. 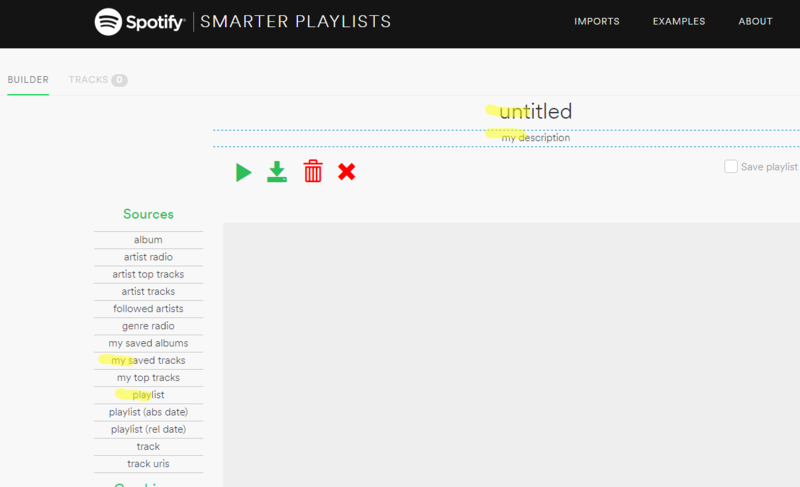 To get the playlist URI, go to the Spotify desktop app and right click on the playlist you want to use as a source. Select Copy Spotify URI. Go back to Smarter Playlists and paste this into the uri field. Hit save. Now open the Filters options at the left hand side and add a track filter. 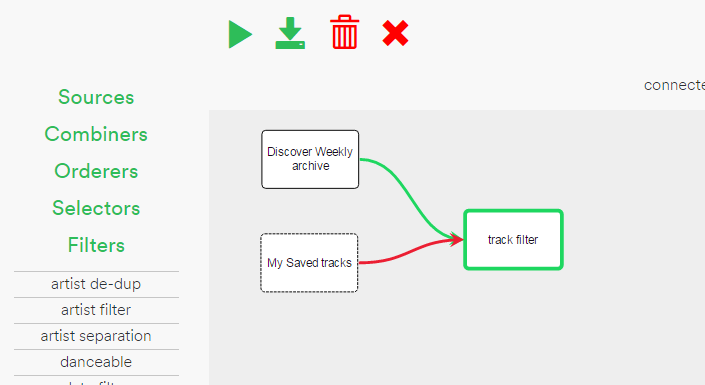 Connect the Discover Weekly archive source box to the track filter box using a green connector and the My Saved tracks source box to the track filter box using a red connector as below. Save the program by clicking the green arrow down icon at the top. Add a shuffle element at the end if you want. It’s in the orderers menu on the left. Connect the track filter box to the shuffle box using a green connector. With the shuffle box highlighted, run the program. Check the tracks tab at the top left to see what’s been generated. If you’re happy with the results (and the name) check the ‘Save playlist to Spotify’ box at the top right and run it again. It should show up in Spotify shortly. This doesn’t work at the moment because of changes to the Spotify API but the nerds on the forums speak highly of it. Creates one big list of all tracks added to Discover Weekly, updated automatically as long as IFTTT keeps working with Spotify. This Archive playlist can be manipulated in the Spotify desktop app to create smaller lists with Shift-Select, Ctrl-C, Ctrl-V,, drag and drop etc. This automatically dumps all the tracks added to Discover Weekly each week into a spreadsheet. Artist, Track Name and Spotify URL for each track are saved. 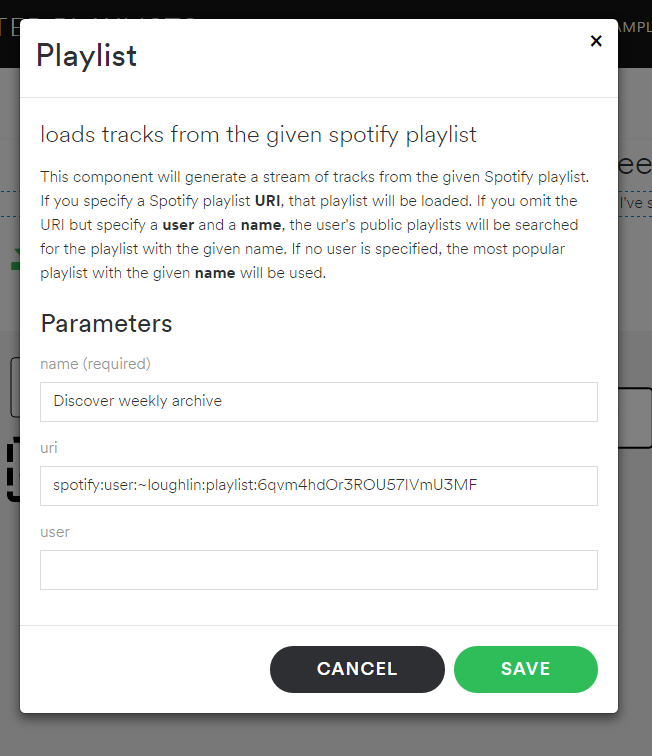 Some combination of these can be used to generate playlists using Playlist Converter, or you can just copy the Spotify URLs and paste them into a new playlist on the desktop app. Spotibot generates playlists based on artists similar to an artist name you give it. roll.io plays tracks from plain text lists or uploads. youtubeinmp3.com – YouTube to MP3 converter. listentoyoutube.com – YouTube to MP3 converter.